When faced with tooth loss, your whole life is affected. No matter if you lose teeth due to gum disease, facial trauma, or another issue, once simple things become incredibly difficult. Eating and speaking become more challenging. The quality of your smile deteriorates, which can cause your confidence to fall significantly. Missing teeth need to be replaced as soon as possible to restore normal functions to your mouth as well as the quality of your smile. At Edge Dental, we can replace missing teeth with dentures. Dentures have been used for hundreds of years as a way to replace missing teeth. They are a removable prosthesis that is still a common solution today. Dentures consist of a base, which rests directly on your gum tissue, which holds replacement teeth. Dentures today are much more realistic in appearance. Long gone are the days of obviously fake teeth. The base, made of acrylic, is colored to match the color of your natural gum tissue. The teeth, which are acrylic resin, are designed to look exactly like natural teeth. A full or complete denture is what most people picture when they think of dentures. This type of restoration is made to replace an entire arch of missing teeth, whether it is the top arch, the bottom arch, or both. Before receiving your denture, any unhealthy teeth that are still sitting in the arch need to be removed. After removing the teeth, an impression is taken. This impression is used to design and create your custom denture. If you are missing several consecutive teeth, but still have healthy teeth in the arch, we can provide you with a partial denture. This allows your healthy teeth to remain in your jaw. Much like a full denture, a partial denture is made from an impression of your mouth. It consists of an acrylic base with acrylic resin teeth. Partial dentures also have metal clasps, which are used to provide additional support by attaching to your healthy teeth. While dentures are still a common restoration and their design has been greatly improved upon, they still have several disadvantages. 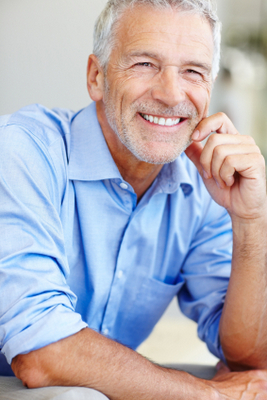 Today, there is an alternative to traditional dentures that addresses these issues and more. Dental implants are a modern-day solution for replacing missing teeth. They use small titanium posts to support your ceramic dental restorations. The posts are surgically implanted into your jawbone, where the bone gradually fuses to them. This process, called osseointegration, stabilizes the posts within your jaw. Dental implants can be used to replace a single tooth, a section of missing teeth, or an entire arch of missing teeth, and they are designed to address many of the common issues experienced by denture wearers. Dental implants are completely stable. They will not shift around in your mouth or fall out. They also do not need to be removed for cleaning. They are also much more comfortable and help to stop and prevent the bone loss that follows tooth loss. If you are missing teeth, it is essential that you have them replaced as soon as possible. For more information, and to discuss your options, call Edge Dental at (281) 940-8940 today.